1.) Line a large baking sheet with foil and preheat the oven to 450 degrees F. 2.) 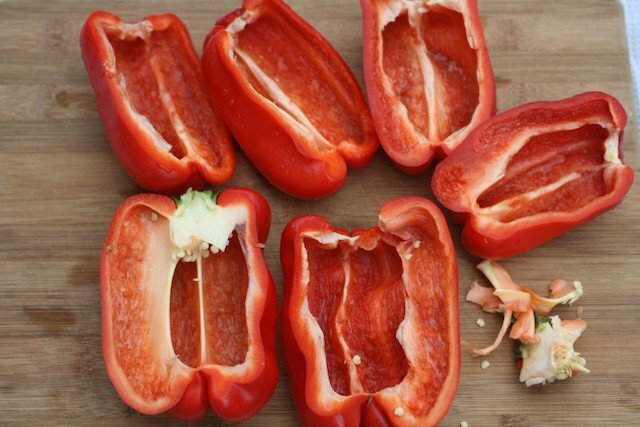 Wash and slice the bell peppers in half lengthwise. Remove the seeds and membranes. 3.) Place side down onto the baking sheet. Bake for 30-45 min or until charred skins. 4.) While the peppers are roasting combine the remaining ingredients except for the olive oil and paprika into a medium sized saucepan. Bring to a boil; reduce heat to low and simmer. Stir occasionally to prevent any sticking. 5.) 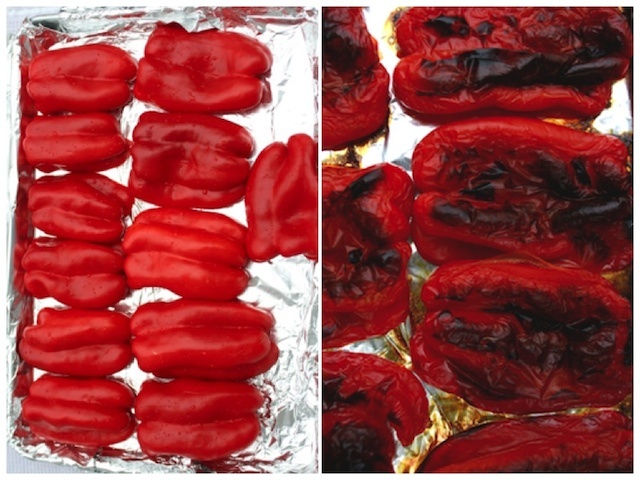 When peppers have finished roasting; transfer pieces onto aluminum foil and wrap securely. Keep peppers in foil until cooled (about 5-10min). This helps with the peeling process. 6.) 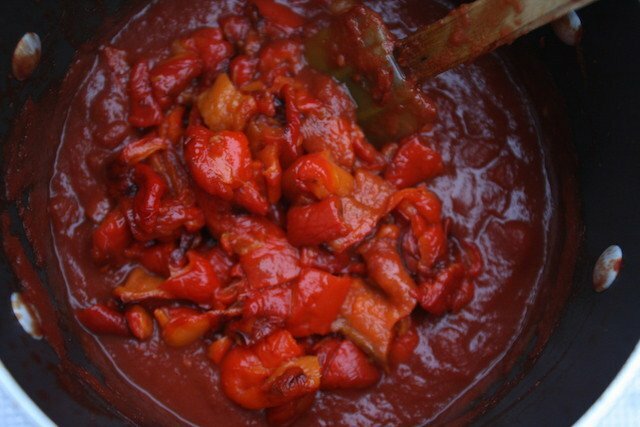 Once peppers have cooled in the foil, peel the skins off the peppers and coarsely chop; add to the tomato mixture. 7.) Continue to simmer mixture for 30 minutes over medium low heat. 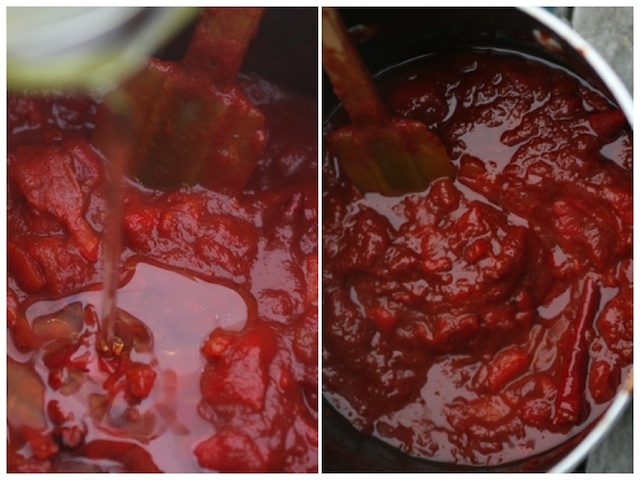 Be sure to have a lid on at all times as the tomato mixture can splatter during the simmering process. 8.) After 30 minutes add the olive oil and paprika to the tomato mixture and continue to simmer for an additional 30 minutes. Stirring in-between to prevent any sticking. Line a large baking sheet with foil and preheat the oven to 450 degrees F.
Wash and slice the bell peppers in half lengthwise. Remove the seeds and membranes. Place side down onto the baking sheet. Bake for 30-45 min or until charred skins. 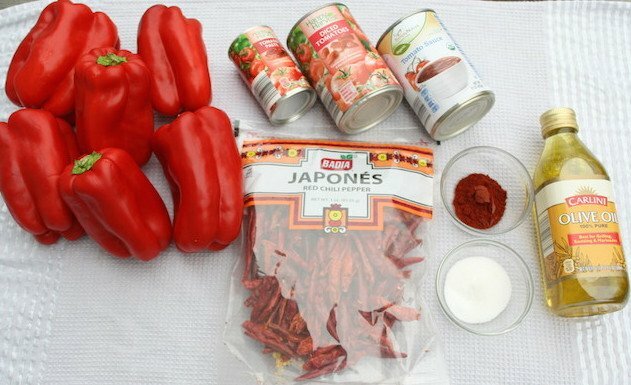 While the peppers are roasting combine the remaining ingredients except for the olive oil and paprika into a medium sized saucepan. Bring to a boil; reduce heat to low and simmer. Stir occasionally to prevent any sticking. 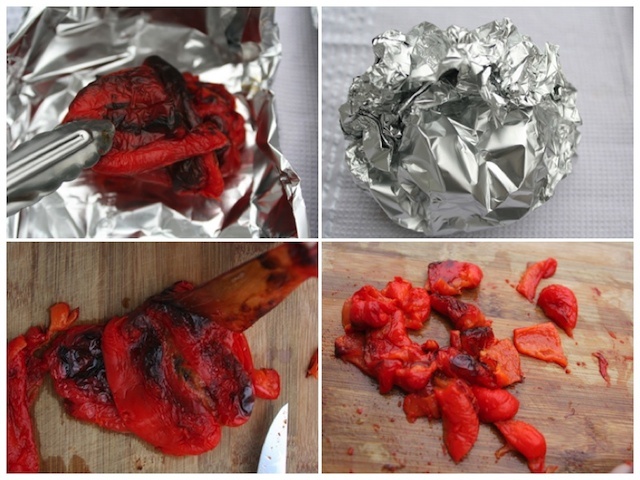 When peppers have finished roasting; transfer pieces onto aluminum foil and wrap securely. Keep peppers in foil until cooled (about 5-10min). This helps with the peeling process. 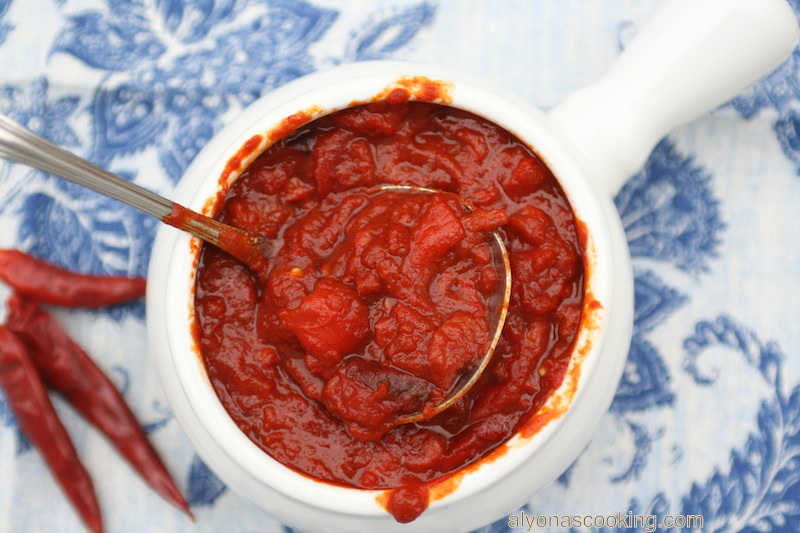 Once peppers have cooled in the foil, peel the skins off the peppers and coarsely chop; add to the tomato mixture. Continue to simmer mixture for 30 minutes over medium low heat. 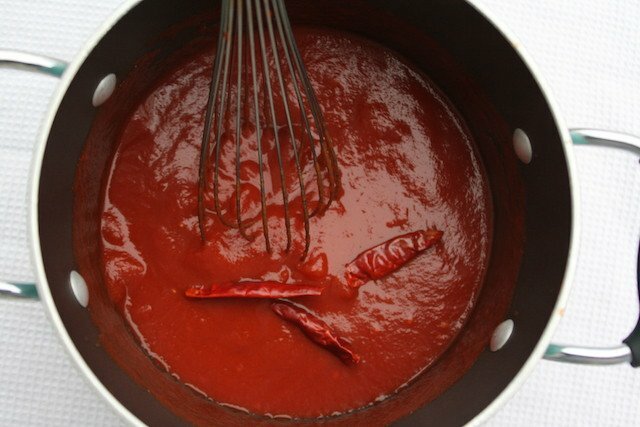 Be sure to have a lid on at all times as the tomato mixture can splatter during the simmering process. 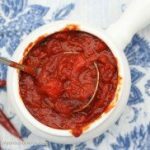 After 30 minutes add the olive oil and paprika to the tomato mixture and continue to simmer for an additional 30 minutes. Stirring in-between to prevent any sticking. Is peeling the peppers necessary? The skin should be soft and easy to eat, right? It’s just a matter of preference? 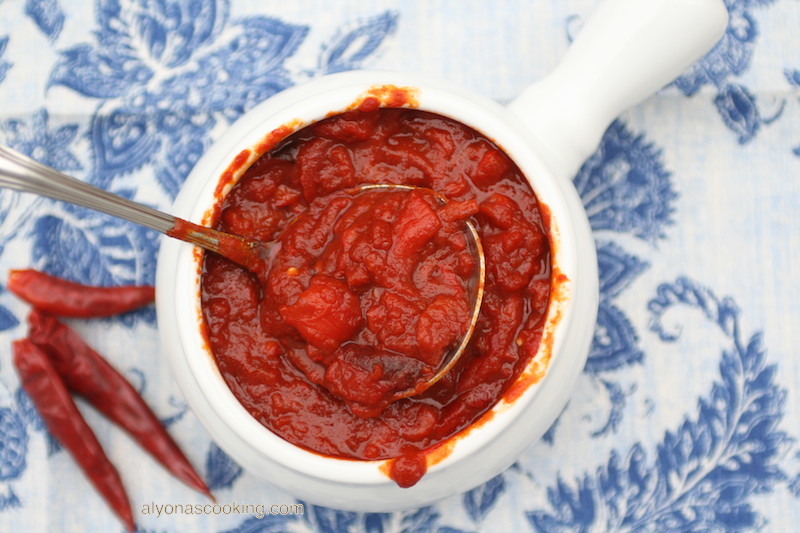 The roasted peppers are an important step in this recipe as it gives much flavor to this dish, so peeling is necessary when roasting the peppers. Great shakshouka recipe! I have others I use at request on occasion, but this is my go-to for my family. Goes beautifully with the flat bread I make @ the same time. 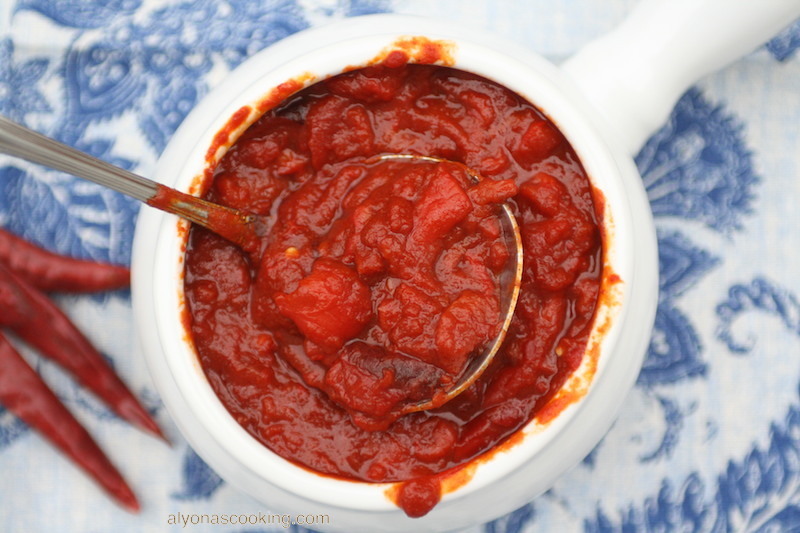 Quick, super easy, a 24/7 recipe fave! Thanks so much for your post! this dish is without eggs but thank you for the feedback!